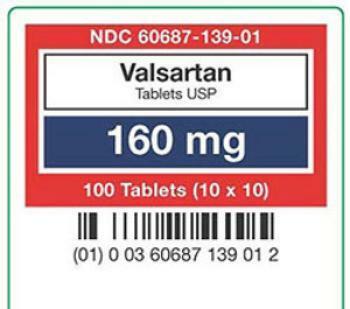 American Health Packaging is recalling one lot of Valsartan tablets, which are used to control high blood pressure and for the treatment of heart failure. Trace amounts of an unexpected impurity, N-nitrosodiethylamine (NDEA) -- a probable human carcinogen – have been found in the product. There are no reports of injury or adverse events to date. Patients should continue taking their medication, as the risk of harm to their health may be higher if the treatment is stopped immediately without any alternative treatment. Patients should contact their pharmacist or physician who can advise them about an alternative treatment prior to returning their medication. Consumers who have the recalled product should call (877) 475-5864 to receive a return packet.